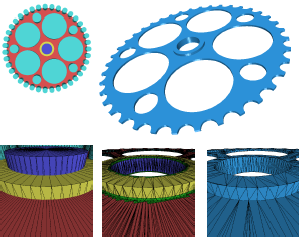 In this paper we present a novel method to compute Boolean operation polygonal meshes. Given a Boolean expression over an arbitrary number input meshes we reliably and efficiently compute an output mesh which faithfully preserves the existing sharp features and precisely reconstructs the new features appearing along the intersections of the input meshes. The term "hybrid" applies to our method in two ways: First, our algorithm operates on a hybrid data structure which stores the original input polygons (surface data) in an adaptively refined octree (volume data). By this we combine the robustness of volumetric techniques with the accuracy of surface-oriented techniques. Second, we generate a new triangulation only in a close vicinity around the intersections of the input meshes and thus preserve as much of the original mesh structure as possible (hybrid mesh). Since the actual processing of the Boolean operation is confined to a very small region around the intersections of the input meshes, we can achieve very high adaptive refinement resolutions and hence very high precision. We demonstrate our method on a number of challenging examples.